Could Cork be the next big psychic hub? By TheCork.ie on 1st February, 2019 Comments Off on Could Cork be the next big psychic hub? We had psychic flower arrangements at Cork comedy festival back in 2017, but could we become the go to place for psychic readings? 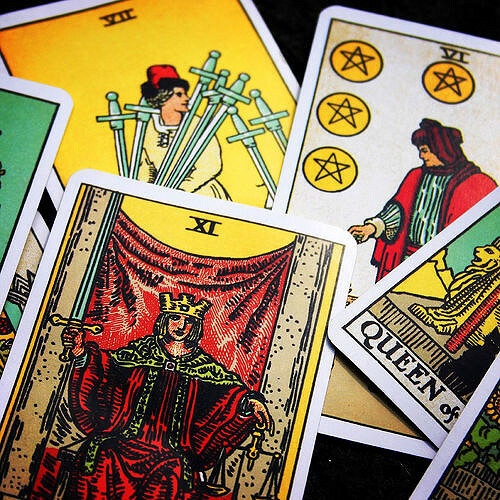 In Cork, you can access a range of psychic readings; including tarot readings, spirit guides and 80-year-old Gypsy Kathleen. Kathleen Lee has been reading palms and cards at Puck Fair, the traditional, annual festival in County Kerry, for more than 70 years. It runs in her family, as her grandfather Gypsy Lee, who passed on the gift, also told fortunes at Puck Fair every year. Gypsy Kathleen is incredibly popular at Puck Fair, with a constant queue through the day, she often has to turn people away. She has had some famous clients in her time, including Patrick Swayze. Her customers frequently return for a visit, to tell her the predictions have come true, and this has led to her huge popularity in the area – people really trust the readings from Gypsy Kathleen. The Cork Spiritualist centre in is run by Catherine Lowry, a nurse and gifted spiritual medium who provides readings on life after death, and focuses on healing. She also hosts events and workshops, making Cork a real hub for making spiritualist and psychic connections. On the 11th of February she is hosting a Wellbeing and Alternative day at the Westlodge Hotel, where she will be providing psychic readings amongst the other activities of the event. As psychic readings remain popular, many Readers have begun to offer services online, as well as face to face. Online and phone-based psychic readings are increasingly popular, largely because of their convenience and wide choice of Readers. It makes things a little more accessible for those questioning what this is all about. It’s different for everyone, so trying it out on a site where you can choose from a wide pool of specialities is something you could take advantage of, before venturing into the spiritual community of Cork. As well as the two mediums mentioned above, Cork is also home to the Dervish Bookshop and Holistic centre; a bright and artsy place to pick up incense, crystals, jewelry or your own set of tarot cards. They have a large selection of books which provide a welcome to the community for those who may not understand the benefits in readings, to those well-versed in spirituality but keen to gain further knowledge, and an outside perspective of the spiritual realm. Whether you think spiritual mediums and psychic readings are false; if you’re a deep believer, or undecided, there’s no denying the presence of these spiritual outlets in Cork. Our city is becoming a hub for psychic readings whether we believe it or not! But as with any strong communities growing out of the place we call home, we need to accept and welcome people along with their unique abilities and belief systems. It’s a great opportunity to get excited by new ideas and appreciate the flare this new subculture is bringing to our city.